Satellite thermal control continues to evolve into a distinct discipline in the space industry and the current trend in spacecraft design demands innovative thermal control hardware and methodology to accommodate the high-thermal density electronics of today’s satellites. This course provides the background and specific information to begin conducting thermal analysis and to participate in the thermal design of satellite systems. It presents basic principles of spacecraft thermal design, including an overview of satellite systems and space flight thermal environments, active and passive thermal control hardware, cryogenic cooling systems, and thermal analysis tools used in the aerospace industry. There is also a complete overview of the satellite thermal control testing process. The course benefits entry-level thermal engineers without extensive spacecraft experience, engineers in other related disciplines, system managers, and government professionals in the space industry who do not have a background in thermal design but who must make program-level decisions involving thermal design. Participants only need a basic understanding of conductive, radiative, and convective heat transfer principles. 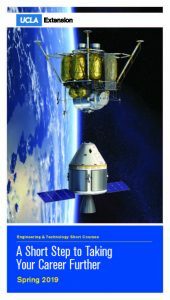 The text, Spacecraft Thermal Control Handbook: Fundamental Technologies, Second Edition, David G. Gilmore, editor (AIAA Aerospace Press, 2002), and lecture notes are distributed on the first day of the course. The notes are for participants only and are not for sale. David G. Gilmore is a Senior Engineering Specialist in the Spacecraft Thermal Department of The Aerospace Corporation and has over 35 years of experience in the design, analysis and test of spacecraft thermal control systems. He has provided support to a wide range of scientific, commercial, and national security spacecraft programs. Responsibilities include independent design, analysis and review of spacecraft and instrument thermal control systems as well as support to source selections, thermal tests and launch and flight operations. Dr. Tung T. Lam, Ph.D, P.E., is currently the Director of the Spacecraft Thermal Department at The Aerospace Corporation, El Segundo, California. He is responsible for thermal control of every satellite in the Aerospace portfolio, which includes a wide range of national security-related projects and NASA missions. He has published more than 70 journal papers and conference proceedings and is a contributing author to major sections of Aerospace’s Spacecraft Thermal Control Handbook. He is the organizer of the annual Spacecraft Thermal Control Workshop at Aerospace and several international conferences, and is an associate fellow of the American Institute of Aeronautics and Astronautics (AIAA). Dr. Sidney Yuan is an internationally known expert in Cryogenics. His expertise include analysis, design and manufacture of cryostats, cryoradiators and mechanical cryocoolers. He has been teaching an undergraduate course at UCLA on Cryogenics since 2003. Dr. Yuan co-authored a book on Cryogenics- Low Temperature Engineering and Applied Sciences. He is the Editor of “Space Cryogenics Workshop Proceedings”, 2010. Guest Editor, of Cryogenics Journal, Elsevier, Volume 50, September 2010 and Technical Editor of Proceedings of Advances in Cryogenics Engineering, 2011. He has over 60 publications with more than 55 scientific papers. Dr. Yuan has three patents and six pending patents in Cryogenics. Dr. Yuan is a Sr. Engineering Specialist at The Aerospace Corporation. He was the Technical Director of Raytheon’s Space Cryocooler Division and the Chief Scientist for L3 Com (previously known as BEI Electronics) Tactical Cryocooler Division.